TERRE HAUTE, Ind. - Indiana State University students, faculty and staff will be able to sneak a peek at the newest addition to campus -- the Student Recreation Center -- from 4-7 p.m. on April 6. "This preview of the Rec Center is a way for us to thank the students who have funded this building through student fees and to let them see the progress that has been made over the last several months," said Thomas Ramey, vice president for student affairs. The 109,420 square foot facility designed by Hastings+Chivetta Architects of St. Louis, houses a three-court gymnasium, an aquatics facility, fitness center, elevated jogging/running track, healthy snack bar, multi-purpose activity rooms, an outdoor adventures equipment center, a multi-activity court, locker facilities, and offices. 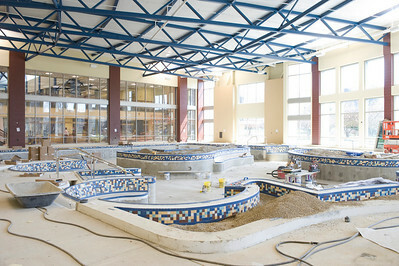 While the building will not be operational for the April 6 preview, visitors will be able to step into areas that will offer expanded intramural sports, space for open/unscheduled play, fitness and exercise training, lifestyle/wellness education, aquatic activities, outdoor adventures and a social space in the near future. "This facility was requested by, designed for and paid for by students. It's their facility," John Lentz, director of recreational sports, said. The Center, located east of Lincoln Quad and accessible from Tippecanoe Street, will enable Indiana State to promoting healthy collegiate lifestyles, encouraging a life-long commitment to fitness, introducing new recreational formats and enhancing the sense of community on campus. "In recent years, recreation centers have become the social gathering place on university campuses for students to see and be seen by other students," said John Beacon, vice president for enrollment management, marketing and communications. "Having a new, state-of-the-art, multi-functional facility on our campus will undoubtedly have a positive impact on our ability to attract and retain both traditional and nontraditional aged students." Current students are excited about the present as well as the future. "The buzz about the Rec Center is growing as students are able to see progress being made," said Student Government Association President Michael Scott. "I'm really excited that SGA has played a role in preparing for its opening and we look forward to playing an active role throughout its existence." Members of Student Government Association are excited about taking an early look inside the Rec Center. "Many students have anticipated the day when they will finally have the ability to go inside the facility and the planned Preview Day will give them that opportunity," Scott added. "I hope many students will take advantage of this opportunity and walk through the facility." Scott is also excited about the building's upcoming ribbon cutting in July. "Upon completion, I sincerely believe that the Rec Center will become the new mecca or hub for students on campus," he said. "Not only will it provide recreational activities, but it will also offer an opportunity for students to interact with friends and make new ones." A student committee, appointed by the Student Government Association, is charged with establishing operating policies and making program recommendations for the facility. The committee is advised by Lentz and Ramey. The committee began its work in fall 2008 and will continue as a standing committee of SGA. Indiana State University students, faculty and staff will be able to sneak a peek at the newest addition to campus -- the Student Recreation Center -- from 4-7 p.m. on April 6.